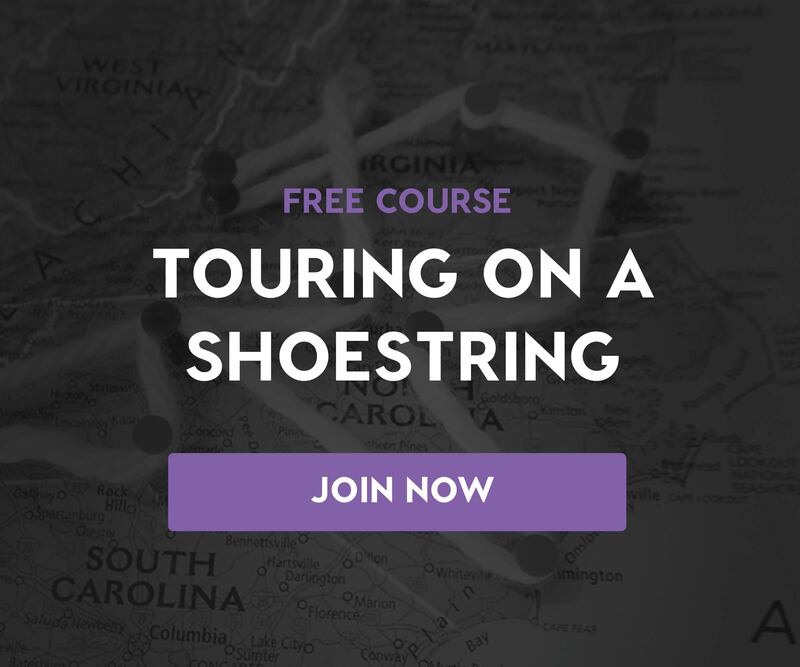 Video still taken from Soundfly’s course, Touring on a Shoestring. Personally, I hate corporate update emails. I ignore them most of the time. I do pay attention to emails from certain bands and labels. They work on me. Here’s some context: I recently abandoned my email account and started an entirely new one because I was overwhelmed by the number of mailing lists I couldn’t seem to unsubscribe from, unsafe phishing emails, and spam. Starting over has helped me recognize which email marketing lists I missed being on and pinpoint which lists are working. Emails from bands like Direct Hit! and labels like Paper + Plastick Records always got through to me — I knew about upcoming releases and tour dates, and they rarely felt spammy. Since I play in several bands and have started to run a record label, myself, I’ve lately wondered if it was worth the time and effort to set up and start writing my own mailing list. Naturally, I figured it was best to crowdsource the answer to this question, so I asked Vinnie Fiorello from Paper + Plastick, Tony Shrum from New Noise Magazine, and Nick Woods from Direct Hit! to give me some feedback. All three kindly obliged. First, though, I want to look at some of the claims Oshinsky made in his article about email marketing and how I think it might relate (or not relate) to those of us involved in the music industry. When Oshinsky mentions “unique voices,” he tries to explain that emails should come from a distinct personality and not be written in complete marketing speak, because otherwise, the consumer has no chance of building a relationship with the marketer or brand. Firstly, I want to point out that while I agree with the general concepts here regarding tone of voice, his “space reserved for… a handful of trusted newsletters or brands” idea doesn’t always hold up in reality. Unfortunately, you have to be extremely careful about what lists and apps you sign up for, because companies can sell your information to third parties; and malicious hacking spam bots are always on the prowl. Gmail’s Promotion, Social, and Primary inbox separators can help organize life for an oversubscribed person, but inbox privacy is much more complicated and nuanced then Oshinsky’s simplified statement. Now obviously, the perspective of someone who works at Buzzfeed is a bit different than that of an independent musician. Buzzfeed tracks their analytics, seeing what emails generate clicks to find out what’s working. But in the music industry, website clicks aren’t as important to artists as album streams, merch sales, and concert ticket sales. So does email marketing help artists and labels to succeed in that fashion? Let’s find out! Direct Hit! and a bunch of hotdogs. I first heard Direct Hit! in 2010 on a split record with Mixtapes where they both played their own versions of the song “Werewolf Shame.” I loved it, so I went to their Bandcamp page to see if they had anything available for free. It was there that I signed up for their mailing list. It may have been a requirement to complete the download, but that was fine as the music was free and I figured I could always unsubscribe. A year or two and thousands of neglected spam messages later, I saw a message in my inbox from their frontman Nick Woods about a new album and some tour dates. I realized that since I’d been on the band’s mailing list, they’d never sent anything that had felt like spam. Instead, they showed up to occasionally remind me Direct Hit! existed and was actively doing things. Given the band’s recent signing to Fat Wreck Chords and opening slots for Reel Big Fish, NOFX, and even Blink-182, I reached out to Nick to ask if he attributed any of this success to their mailing list. And look where they are now! Direct Hit! is a band that is on the road touring and meeting new people every night. Not only are they actively marketing themselves via the internet, but they’re doing it in person alongside those efforts. That’s a benefit that companies running regular email lists don’t have. If you’re an artist, you need to recognize the unique opportunity you have as a performer — that you get to interact face-to-face with your fans, while your label does not. Sure, bands might take copies of a magazine to a show or have a label’s logo on the back of their records, but the personal relationship between the buyer and product are missing. Use that to your advantage. Ask fans at your shows to join your email list. Explain to them what sort of emails you send. Do as much as you can to connect your online and offline worlds, promoting your shows via your email list and your email list via your shows. The more often and more personally you talk to your fans — in person and in email — the stronger your fan relationships become. + Learn more on Soundfly: Building your mailing list and maintaining a healthy social media presence are two ways you can guarantee early traction on your crowdfunding campaign. Learn more in Soundfly’s Mainstage course Crowdfunding for Musicians. Vinnie Fiorello behind the drums. An email list is one part of an overall sales strategy, but it isn’t the only thing that goes into promoting artists. It’s important to keep the conversation going, beyond a single monthly mass email, and make sure you’re connecting with fans across platforms and in a variety of ways that feel relevant to them. “I think it helps more than it hurts” is the first thing Tony said to me when I asked him how worthwhile maintaining his mailing list is. And that’s the commonality between Direct Hit!’s experience as well as that of Paper + Plastick and New Noise. Mailing lists, when done right, can only help you. You may get a handful of unsubscribes each time you send a mailing, and it’s a lot of work to write, re-write, edit, and format these things, but all in all, emails contribute to an important dialogue you should be trying to create with your fanbase. So is it worth our time and effort? Personally, I think it is, and will probably start one for my own label coming up here soon. The single most important thing for an artist to do with their marketing efforts is to keep the conversation going with their fans — to support and grow fans into the kinds of people who will come out to shows and buy albums. And it’s undeniable that email is one effective way to keep that conversation going. But it does have its limits, and it isn’t the only way you should be connecting with your fans. If you’re going to invest your time into a mailing list, keep it personal, and keep it relevant to your fans’ interests, and who knows, maybe six years from now, one of your fans will be writing an article about how much they’ve enjoyed your email list! What have your experiences been with mailing lists for your band or brand? Let me know in the comments below or over on Twitter @Robolitious.